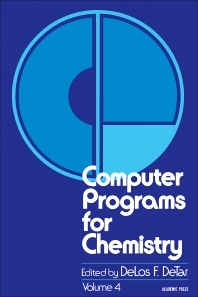 Computer Programs for Chemistry, Volume 4, aims to make available a useful collection of tested programs, which may be expected to have a long useful life. Since the programs in each volume are represented by considerably over 10,000 source cards, arrangements have been made to provide a master tape for each volume. The programs in the series fall into two broad classes: complete packages and subroutines. ANSI FORTRAN has been chosen as the language since it provides adequate flexibility and excellent compatibility. But where departures are needed for efficiency, the editors have not hesitated to allow use of small subroutines in nonstandard FORTRAN or in assembly language, with careful documentation. The programs discussed in this volume include LSKIN2, FRS3, GENLSS, CDORD, EQCENT, EDITQ and EDITID, LORAK, and INDEX. Anyone who intends to use computer techniques will have to learn about computer hardware and computer software. To use effectively even the stand-alone programs in these volumes requires some understanding of FORTRAN. This volume also contains a number of converting subroutines that are useful primarily to the serious programmer. These have proved especially useful as parts of programs presented in previous volumes. 3-15 What if the Computation Blows Up?